‘MOORSVIEW' is a new landscape photography event being organised in Pickering, North Yorkshire. The event began life with an idle conversation about some of the well known landscape photographers who live close by - Joe Cornish and David Ward, to name but two. This led on to consideration of the fantastic variety of opportunities offered to photographers by the landscapes of the North York Moors and coastline. This enthusiasm was tempered, however, by various recent instances of photographers getting into difficulties when out in the wilds. On the face of it landscape photography seems like a pretty calm, reflective, and ultimately safe pastime. But like many outdoor activities, it all depends on how you go about it. For example, as the rain swept in across the North York Moors the other evening, and I took shelter in the lee of Skelton Tower, the thought struck me that nobody knew where I was. Now don’t get me wrong, I was not concerned, in fact I absolutely loved being out alone in the fast fading twilight. And the leaden clouds rushing in filled me with hope that I would get that ‘special light’ that seems to happen after rain. But I also realised that, not for the first time, I had just broken a fundamental rule of hill safety - tell someone where you are going..! Who is involved in MOORSVIEW..? Into the Light David Ward needs little introduction for readers of On Landscape. As one of Britain's foremost landscape photographers, his eye for shape and form is without equal and produces work that is startling in its clarity and intensity. Personally I find that David’s work always manages to make me stop, look, and think. In most landscape photographs the location is the dominant element within the shot - they are identifiably images of a particular place, and are therefore relatively easy to ‘decode’. David’s images are always redolent of the place where they were shot, but he also manages to distill his subjects down to an essence. In the process he often reveals something raw, elemental, universal. David is taking the weather as the subject for his MOORSVIEW presentation - focusing in particular on shooting in challenging conditions. As someone who relishes shooting in so-called ‘bad’ weather, I will be fascinated to hear what guidance he can offer. Personally I feel that Lizzie’s work has lately moved into a calmer, more meditative space, focusing on the ‘quiet beauty’ of the landscape all around us. As well as admiring her work, I can personally vouch for the value of attending one of Lizzie’s workshops - she is responsible for getting me to actually use my tripod again - rather than just carrying it around on my back..! Pickering based husband and wife team Richard and Janet are both past finalists in the Landscape Photographer of the Year and also the Scottish Nature Photography Awards. Their presentation at MOORSVIEW will tackle the thorny issue of establishing an individual ‘identity’ or ‘style’ in landscape photography. Beginning with colour, Richard will discuss how their exploration of minimalist monochrome work - particularly in winter - has been inspirational, and led to a certain ‘brand identity’ for RJB Photographic. Janet will also be speaking about her journey into Infra-red photography - from initial beginnings using infra-red film, through using adaptors on an un-modified digital camera, and on to the present day using a modified DSLR. Dave is a farmer in the beautiful valley of Farndale - in the heart of the North York Moors National Park. In recent years he has been lucky enough to travel to both the Arctic and the Antarctic with his camera, as well as many different parts of the UK, but Dave’s main inspiration remains the immediate area around where he lives - and that will be the focus of his MOORSVIEW presentation. Dave says: “it is a huge privilege to live and work in such an inspiring location and I feel compelled to record it all, from the splendid vistas of heather clad moorland the intimate details along the banks of the river, in all weathers and all seasons. Being able to create images of the beautiful valley that I call home has, over the years, become an essential part of my life”. Karl is a photographer with a particular interest in the natural world, landscapes and fine art photography. With a background in conservation, it is often the ecological detail that intrigues him. This, along with man’s influence on the landscape is what captures his imagination, as much as a stunning vista. Karl is often out ‘biking and hiking’ on the North York Moors, and will bring the photographic lessons learned to his MOORSVIEW presentation. In particular, he will discuss his use of lighter weight, more compact cameras such as the Sigma Merrill and Sony A7R. Karl is currently involved in collaborations with Sigma Imaging UK, and also for Manfrotto - writing articles for websites and social media. Karl has exhibited widely, most notably at the Joe Cornish Galleries, in Northallerton. Karl has a varied portfolio of commercial clients and he now runs bespoke workshops. I am a walker by inclination and, since moving to Pickering more than a decade ago, have spent much of my time exploring the ups and downs of the North York Moors National Park. I will draw on these travels, and the images I have made, to introduce the MOORSVIEW sessions - picking out some of my favourite places to photograph - from the well known to the somewhat more obscure. Personally I tend to be drawn to the grand in my photography - think big skies, serious weather, and sweeping vistas with distant horizons - things there are no shortage of on the North York Moors..! But I am also fascinated by the details of nature - the intricacy of a seed head, the transformative power of hoar frost, the elegiac beauty of a decaying tree. How do I book a ticket for MOORSVIEW..? MOORSVIEW will run all day, taking place on Saturday 31st October, at The Kirk Theatre, Pickering. Day tickets will cost £60 - including refreshments, and a buffet lunch provided by The Black Swan, Pickering. In addition to the sessions highlighted above, there will be a display of outdoor gear by Trailblazer Outdoors - featuring Paramo Directional Clothing in particular. All ticket holders will also be entered for a prize draw, to take place at the end of the day. Prizes are still being pledged, but already include a large framed prints from two of the speakers, a half-day of 1 to 1 photographic training from another, and a range of valuable outdoor gear. Look out for further details on the web - just use the hashtag #MOORSVIEW within Facebook or Twitter. It is shaping up to be an inspirational, and above all 'useful' event - dovetailing the artistic with the practical aspects of landscape photography. We hope that it will also raise awareness of the photographic opportunities offered by the North York Moors and Coast, whilst hi-lighting the need for adequate preparation before heading out into the wilds..! 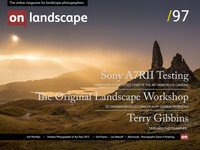 I would like to thank On Landscape in particular for supporting MOORSVIEW. As well as helping us to publicise the event, Tim Parkin has generously offered to loan us his very expensive projector - and fortunately his expertise in operating it. Tim is also hoping to film the MOORSVIEW sessions, for subsequent dissemination through On Landscape.